The fireplace hearth on many old houses will cause a severe potential fire safety hazard! Today a masonry fireplace hearth must have a solid masonry footer below it to properly support it. But back in the day, hearths were often constructed with a sand pan base. A wooden box was recessed into the floor and filled with sand, then the hearth was laid on top of this base. The problem is that as the decades go by and the house settles, the wood base and the sand in it can shift or trickle out below, causing two problems. First, this settling will cause the tiles, brick, marble etc resting on this base to crack and become unsightly. Secondly, and of most concern due to safety issues, the outer hearth can separate from the floor of the fireplace and leave gaps where sparks and heat transfer can cause pyrolysis (decomposition) of the wood framing below that's brought about high temperatures. Pyrolysis can cause the wood below and surrounding the house to ignite at lower temperatures and cause a house fire. If you burn solid fuel in your historic fireplace then it's imperative that you keep in mind how your hearth is built and its potential dangers. If your hearth is cracked then it's an indication that you can have the problem as seen in the photograph above where the wood is already charred and ready to ignite from a subsequent fire. Such a fire can burn down an old house swiftly! Unfortunately this isn't an easy or inexpensive fix. The hearth surface material must be removed along with the underlying hearth support pan. 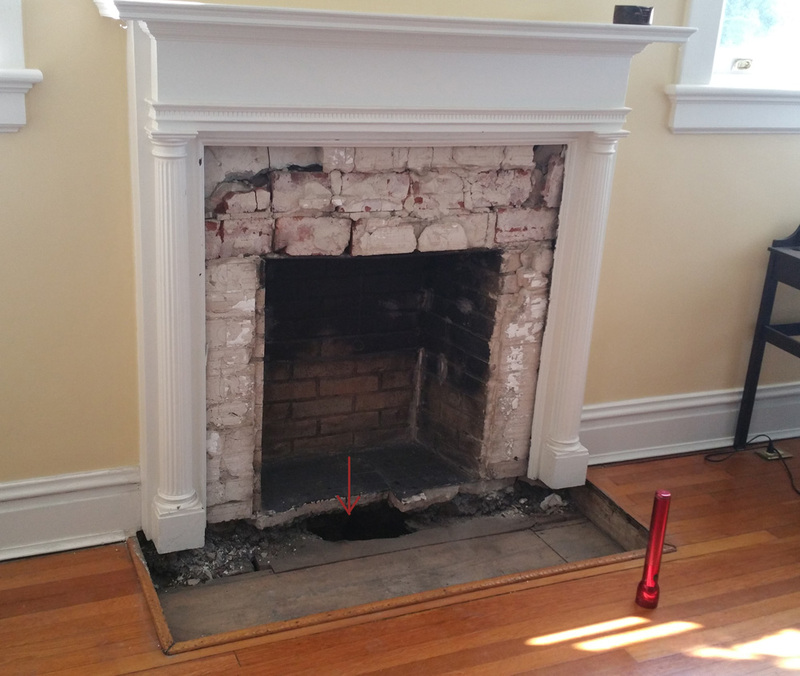 In the photo you can see the old hearth has been removed; we're filling the hearth area with masonry then the whole fireplace is getting a facelift that includes a new tile hearth and face wall, and then we're installing a President gas insert.